Home renovations and improvement can be a big challenge. There is so much you need to keep in mind and it can be a very frustrating experience working on it by yourself. You might hit a point in a project when you’re not sure what the next step to take is, or maybe you begin to doubt yourself and question whether you are choosing the right paint color etc. Well luckily there are now some super iOS and Android Apps available for Home Improvement and even you can look for inspiration from other people and much more. For example, Houzz is a really fantastic app as it allows you to look at other home improvement projects from around the world. Maybe download Houzz and get some ideas or take little bits from homes around the world and create something special in your own home. Houzz is really great for getting the creative juices going, and it may be the app you need to gain some much needed inspiration. Another great little app is TapPainter available for all smartphones and tablets. It allows you to see how a color of paint will look in a room before you even begin. You don’t want to paint a whole room only to realize that the color doesn’t work at all as it difficult to change it after the job is complete. There’s actually a free version of this app called Color Capture which is just as good – so be sure to check that out too. Another app that is really popular is Home Design 3D. It gives you a detailed view of how the room you are renovating will look in 2D and 3D. It really is amazing what apps can do for us in 2016 and it’s exciting to think about apps that will exist in the future. 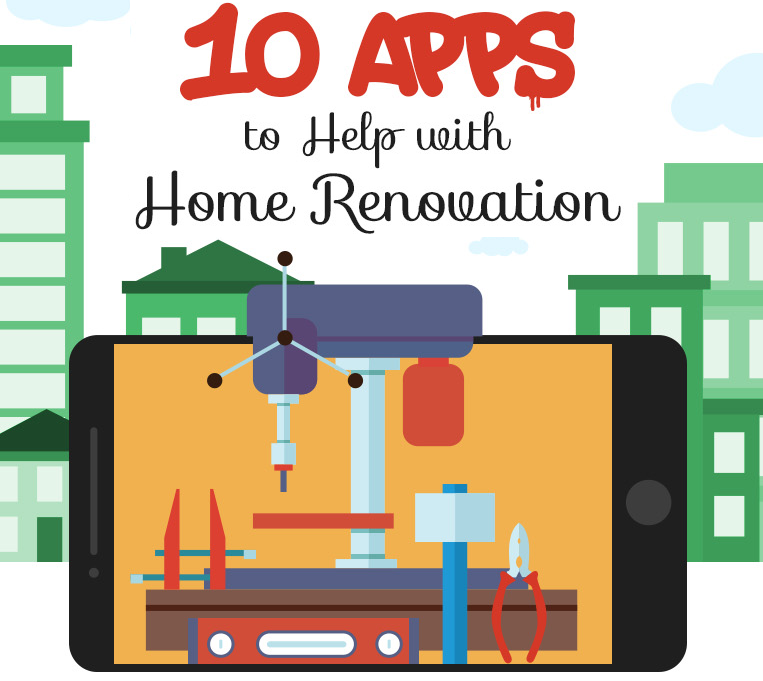 There are also some more simple apps to help you with the basics of home renovations. For example, the Handyman Calculator has a comprehensive range of conversion and calculation features. It’s just so much handier having all of the important calculations available in one simple app. The best thing might be to download some of the free ones to see if they help you – if you don’t find them useful you will have lost nothing. We’re confident that you will find them very useful though and hopefully you’ll get your home renovations finished soon. Find out more about all the home renovation apps in this Infographic developed by team “Half Price”.